ata returned Tuesday, Oct. 31, indicate that NASA's Juno spacecraft successfully completed its eighth science flyby over Jupiter's mysterious cloud tops on Tuesday, Oct. 24. The confirmation was delayed by several days due to solar conjunction at Jupiter, which affected communications during the days prior to and after the flyby. Solar conjunction is the period when the path of communication between Earth and Jupiter comes into close proximity with the Sun. During solar conjunction, no attempts are made to send new instructions or receive information from Juno, as it is impossible to predict what information might be corrupted due to interference from charged particles from the Sun. Instead, a transmission moratorium is put into place; engineers send instructions prior to the start of solar conjunction and store data on board for transmission back to Earth following the event. "All the science collected during the flyby was carried in Juno's memory until yesterday, when Jupiter came out of solar conjunction," said the new Juno project manager, Ed Hirst, from NASA's Jet Propulsion Laboratory in Pasadena, California. "All science instruments and the spacecraft's JunoCam were operating, and the new data are now being transmitted to Earth and being delivered into the hands of our science team." Hirst has worked on Juno since its preliminary design phase, through launch in 2011 and arrival at Jupiter in 2016. He previously worked on NASA's Galileo, Stardust and Genesis missions. Born in Guatemala City, Guatemala, he earned a B.S. in Aerospace Engineering from the University of Texas at Austin and joined JPL in 1993. Hirst succeeds Rick Nybakken, who was recently appointed deputy director for JPL's Office of Safety and Mission Success. "We couldn't be happier for Rick and know he will continue to do great things to further NASA's leadership in space exploration," said Scott Bolton, Juno's principal investigator from the Southwest Research Institute in San Antonio. "Similarly, we are pleased with Ed's promotion to project manager. He has been a critical part of Juno for many years and we know he'll hit the ground running." Juno's next close flyby of Jupiter will occur on Dec. 16. "There is no more exciting place to be than in orbit around Jupiter and no team I'd rather be with than the Juno team," said Hirst. "Our spacecraft is in great shape, and the team is looking forward to many more flybys of the solar system's largest planet." Juno launched on Aug. 5, 2011, from Cape Canaveral, Florida, and arrived in orbit around Jupiter on July 4, 2016. During its mission of exploration, Juno soars low over the planet's cloud tops -- as close as about 2,100 miles (3,400 kilometers). During these flybys, Juno is probing beneath the obscuring cloud cover of Jupiter and studying its auroras to learn more about the planet's origins, structure, atmosphere and magnetosphere. JPL manages the Juno mission for the principal investigator, Scott Bolton, of Southwest Research Institute in San Antonio. 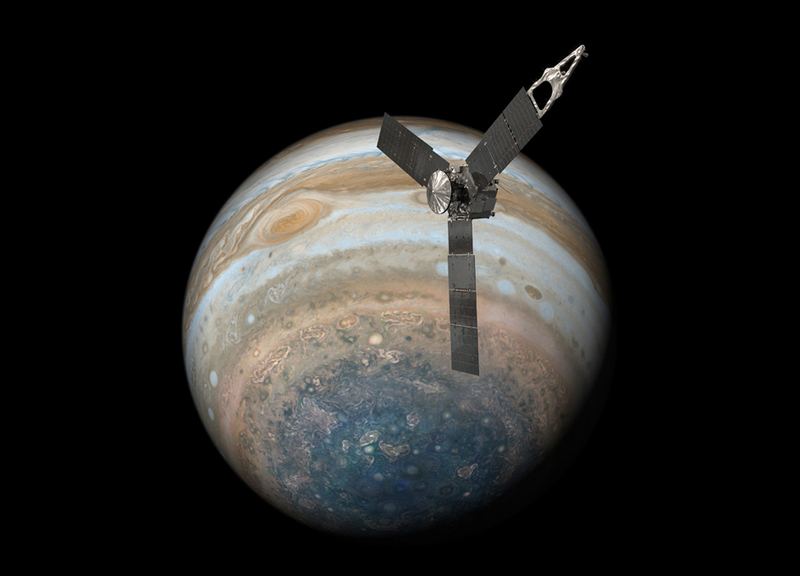 The Juno mission is part of the New Frontiers Program managed by NASA's Marshall Space Flight Center in Huntsville, Alabama, for the Science Mission Directorate. Lockheed Martin Space Systems, Denver, built the spacecraft. JPL is a division of Caltech in Pasadena, California.